Against the Australian tourists, I’m leaving the nagging Terry Alderman well, ducking Merv Hughes’s bouncers and ignoring his unintelligible curses when I play and miss. 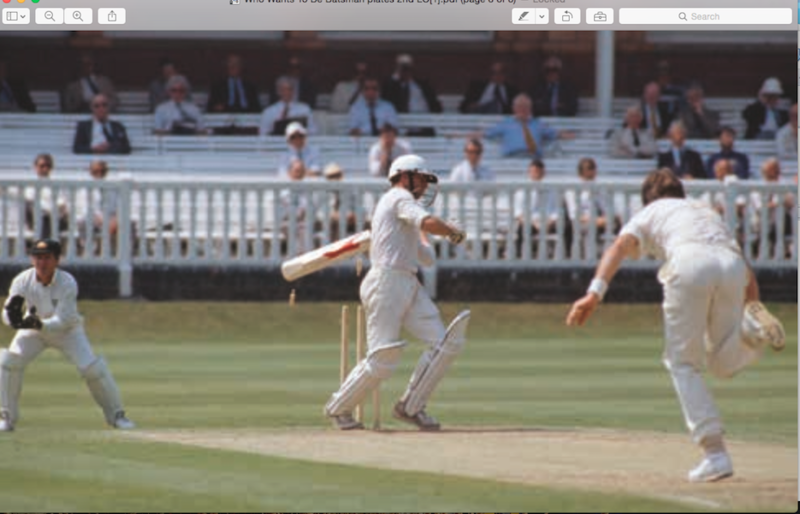 I drive the pace bowler Geoff Lawson (86mph) back past him for four. He smiles wryly. I am friends with Lawson, known to everyone as ‘Henry’. I have played against him in Sydney and been to his house for dinner. I know how he thinks and what he’s going to bowl. I am back on my stumps waiting for the bouncer. It arrives, a bit quicker than I expect. I hook it off my chin, make good contact over the head of the square-leg fielder. But the pace of the ball has disturbed my balance and as I swing round with the momentum of the shot I flatten the wickets with my bat. It’s as good an example as you can get of what happens when you don’t adhere to Ted Dexter’s first principle of ‘holding your position’. As the ball crosses the boundary I am surveying my shattered stumps, much to the amusement of Allan Border who is guf- fawing at second slip. It was about the only time he smiled all tour until the Australians won the Test series 4-0 and regained the Ashes. My county colleagues underlined what they thought of my batting at Trent Bridge one day. We were playing for a draw, and, with about 12 overs left to survive, I came in at No.9. 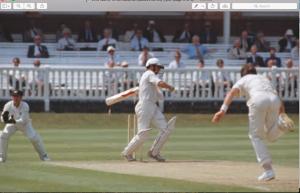 With the memory of fending off Malcolm Marshall for a ses- sion to save a match fairly fresh in my mind, I felt quite confident of achieving the task. As usual I walked out to the middle putting my gloves on, my bat under my arm. It was only when I arrived at the crease that I discovered a condom stretched neatly over the bat handle. I removed it, half amused half irritated, and handed it to the square-leg umpire, Nigel Plews, a former policeman. ‘At least it’s not a used one!’ he said. I settled down to face Franklyn Stephenson, the gangling West Indian pace bowler with a brilliant change of pace. He smelled victory, but I was determined to keep him out. I blocked the first delivery, but the bat slipped out of my hands. The lubricant from the condom had got onto the bat handle and I couldn’t grip it. It was the middle of the over, so I went down the wicket to my partner John Emburey and swapped bats till I could call for a replacement. But the lubricant was now on my gloves and his bat twice slipped out of my hands during the remainder of the over, although I managed a couple of runs. I gripped the bat tighter for the last ball, but the force of the delivery knocked it sideways and I dragged the ball into my stumps. I returned the bat to an agitated-looking Emburey and retrieved mine as I walked disconsolately off. But the lubri- cant had now transferred itself to his bat handle via my gloves. It rendered his bat ungrippable and he was bowled off a bottom edge shortly afterwards. We were bowled out with ten overs left. The dressing room was not a happy place.